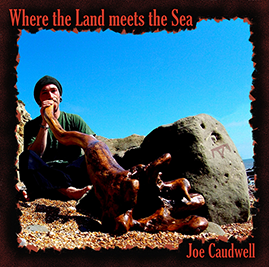 Evocative, relaxing, beautiful, Where the Land Meets the Sea is aimed to “create an ambience that will soothe, relax and inspire the listener” and in that musician Joe Caudwell has succeeded admirably. In fact the only problem with reviewing this album is that after I had listened to it I was far too relaxed to do anything as mundane as write! Where the Land Meets the Sea features 7 tracks (50 minutes) of trance inducing music, including a 22 minute long journey with didgeridoo and ocean drum named, quite simply, Didgeridoo Journey. The album begins with Ancestor which opens with the haunting tones of a Native American flute. This is followed by Mermaid Rock, featuring eerie tones from the didgeridoo and the exquisite ethereal voice of Keri Highland. Another highlight for me was Awakening which featured the sitar playing of Paul Jackson; the first time I’d heard a sitar playing in accompaniment with a didgeridoo – wonderfully otherworldly. By the time the album was into the last track, Veil of Stars, I could picture myself listening sat under a clear, star-filled night sky (although, seeing that it was physically raining at the time, curling up on the sofa was equally rewarding). Where the Land Meets the Sea is perfect for those times when you need to lose yourself for a while. Highly recommended! CD Details: Where the Land Meets the Sea. Joe Caudwell (April 2017). To find out more, listen to tracks and buy please visit Joe Caudwell’s website. Review Details: Where the Land Meets the Sea was reviewed by June Kent, Editor of Indie Shaman magazine and published in Issue 36.